NASA's mostpowerful Mars orbiter has bounced back from some hard luck around the redplanet this year, and scientists are eager to resume the orbiter's detailedobservations of Mars in the new year. After aseries of glitches that began in February, mission managers put the Mars ReconnaissanceOrbiter (MRO) into a protective "safe mode" in August. Thespacecraft wasresurrected earlier this month and resumed its science operations lastweek, much to the delight of Mars scientists, who have waited patiently for theorbiter to return to duty. "It'sgood to have the instruments back on," said MRO mission manager DanJohnston of NASA's Jet Propulsion Laboratory (JPL), Pasadena, Calif. "Thishas been a long stand-down. Now we're ready to resume our science and relaymission." MRO'stroubles began on Feb. 23, when the orbiter underwent a quick reset. It wasfollowed by an event on June 4 that "was virtually identical to the firstone," said Jim Erickson, the spacecraft's project manager at JPL. Engineersstill don't know exactly what caused those rapid resets. They initially thoughtthat a solar particle or cosmic ray struck the probe. In August,another, different reset hit MRO and the craft temporarily switchedover to its backup computer. Whether or not all the resets are related andcaused by the same problem still isn't known. With therepeated events this year, mission managers wanted to take precautions againstthe unlikely but potentially mission-ending event of having two resets happenwithin a minute of each other. On Nov. 30, they beamed up a software upgrade tothe orbiter's non-volatile memory, where information is preserved even ifanother reset interrupts its power. "Aboveall else, we have to make sure the spacecraft is safe," Erickson toldSPACE.com. Engineersran a few more checks and eventually brought MRO out of its safe mode on Dec.8. On Dec. 16, mission managers announced that the orbiter was back in businessand ready to resume science operations, though engineers will be watching forany more resets. Ericksonsaid that during the safe mode interlude, scientists were chomping at the bitto get the valuable orbiter back. MRO has taken the mostdetailed images yet of the Martian surface from on orbit and has made keyfindings that add to the understanding of the geology and history of water onMars. The timingfor MRO's return is fortuitous for its continued observations as well. 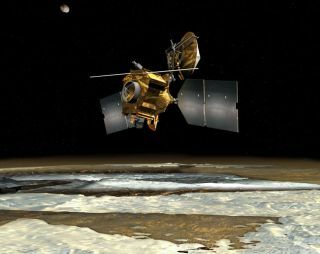 "It isnorthern spring in the northern hemisphere on Mars, and we are eager to takeadvantage of the good visibility provided by the relatively dust-freeatmosphere present at this season," said JPL's Rich Zurek, MRO projectscientist. "A major goal of the mission is to look at changes on Mars. Forexample, the instruments will observe the changing polar caps, examining theextent and composition of the retreating north polar frosts and the growth ofthe south polar cap during this period." MRO is alsoimportant for its relay capabilities with other Martian spacecraft,particularly NASA's twin rovers, Spirit and Opportunity. Those functions havealso resumed, NASA said. MRO's mission,which began after it reached Mars in 2006, is extended through 2010. Missioncontrollers will send in proposals for further extensions in January, and thosewill be decided in February, Erickson said. Erickson isconfident that MRO's capabilities will be in demand for quite some time –especially with new missions, such as the Mars Science Laboratory, coming up –and mission engineers plan to do everything they can to watch the craft andkeep it safe and running.